Got the Kayak for Christmas. Now What? Every year it happens. For the last decade that I have been around kayak fishing, Christmas brings a great new flood of people to the sport I love. Thousands of new anglers, looking for a way to get on the water or maybe a different way to get on the water, ask for and receive a kayak for Christmas. Often times these gifted kayaks are not the $2,000 super decked out angler editions. They are sit-in or sit-on kayaks purchased at major chain stores. You know what? And hear me say this: THAT IS JUST FINE! You don't need to have a BMW 7 Series car to drive on the highway and you don't need the Hobie Pro Angler 14 to get on the water. Would it be nice? Dang skippy. Is it necessary? Not even close. I fished my first six, almost seven years out of a $200 sit in kayak from Academy Sports and Outdoors. And it was great. 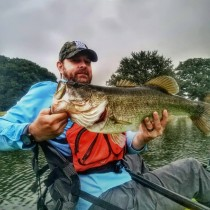 I fished differently than I do now but every kayak owner fishes a little differently and some of that comes from the type of kayak they fish from. The important things to remember are safety, time on the water and customization to fit your needs.These throngs of people often find their way to kayak forums and ask the same questions. That is when they get a good taste of what our sport is about. Sharing. More specifically, sharing information. The questions typically revolve around accessories, where to try, and what is all this I hear about tipping over?Today, I want to give you some of what I have learned both from the school of hard knocks and by others in the sport who have mentored me. PFD (Life Jacket)- Most people go straight for the paddle. The only reason I recommend a PFD first is safety. If you blow all of your money on a fancy paddle and end up paddling in an $8 PFD that fits like an albatross, you won't be paddling for long. Choose a good PFD and always wear it. Check out the NRS, MTI and Stohlquist PFDs. Light, Whistle and Knife-I also recommend a knife and a whistle to attach to the PFD so you can call for help or cut your way out of a tangle or hung anchor. If you are going to paddle at night, get a 360 degree light. The YakAttack Visicarbon Pro with Flag is a popular choice amongst kayakers everywhere.The PFD and whistle are legal requirements in most states. The light is also if you are out at night. If you really want to see, be seen and even attract fish, check out some high powered LED lights like Super Nova Fishing Lights. Paddle- This is your motor.If you only have two upgrade things you can buy, they need to be a good PFD and a paddle. That seems like a no-brainer but lots of people skimp on these and sell their kayak shortly after from non-use. Anchor Trolley- It seems strange to buy this before an anchor but believe me when I say you will be much happier if you do. An anchor trolley allows you to use a drift sock, stake out stick and anchor while positioning yourself to take advantage of the wind, not be a victim of it. This also will allow for a quick release if you get into trouble. This is the one I use. Inexpensive and easy to install. Anchor- This is the most widely underpurchased item under $50. Anchors exist in all shapes and sizes. The most popular one is the collapsible anchor. If you are going to be in water eight feet deep or less, I suggest a YakAttack Park-N_Pole. It can double as a push pole, GoPro camera pole and many other things. Very versatile and it floats. It comes in three different lengths to fit exactly what your needs are. Anchor Rope (and accessories)- Most anchors don't come with rope. If you are going to be fishing in any current or wind at all most people will recommend 2X the length of rope for the depth you are fishing. So if your fish are in 20 feet of water, you need at least 40 feet of rope. If you are fishing on the coast it is recommended 3X the depth. I like 3/16" rope but choose what you like. Just don't buy 1/16" rope and expect to raise a big anchor easily. While you are there in the rope section, pick up a carabiner and rope float to attach to these as well. Rod Holders- These come in different varieties. You can get flush mount, rocket launchers, trolling rod holders for baitcasters and spinning, rail mount, and the list goes on and on. Look at some rigging pictures, sit in your boat, see where you can reach and then go buy one. Milk Crate- You can buy one or ask a retail grocer for one. Either way, you can strap this down to the back of most kayaks and hold tons of tackle and gear. You can also add some PVC to be additional rod holders. Cheapest investment you'll love forever. Eventually you may want to upgrade to a YakAttack BlackPak. This is the king of all packs to haul gear and hold rods. Everything Else-These things will get you going pretty well. After you have the above mentioned items, you should look at, in no particular order: a fish finder, stabilizers (depending on the kayak), drift sock, stake out stick, VHF handheld radio, scupper plugs (for sit on tops), waders, paddle gloves, really the list goes on and on. Your fishing adventure is just that. Add things as you can and see what others are doing. Go to get togethers. Visit kayak shops.Talk to guys who have years or even decades on the water. Talk to the new guys. See what's new, what's a need, what's a want and go for it. And if you buy something that doesn't work out, there is always the buy-sell-trade forums. Most of all, have fun and catch some fish! Great article Chris! Most important....al ways wear your PFD! It will save your life! I just started this past May with a basic sit-in yak and it has provided me with everything I wanted when it comes to fishing and recreation. Like Kayakjak said the PFD is the most important. Any new kayaker should purchase safety equipment then the others as they see fit. Thanks for another great article Chris.